The Chicago North Shore Convention & Visitors Bureau (CVB) is a non-for-profit based tourism organization that promotes the communities of Evanston, Glencoe, Glenview, Northbrook, Prospect Heights, Skokie, Wheeling and Winnetka, Illinois to travelers, groups, meeting and event planners. J Rudny was contracted by the Chicago's North Shore CVB to create a fully responsive website complete with a robust content management system and integrated CRM service. The Chicago's North Shore project consisted of several major solutions to make their staff more efficient, as well as integrated with their current CRM api system. Combine the main and mobile sites into one fully responsive website for all devices. Integrate their current CRM with their website. 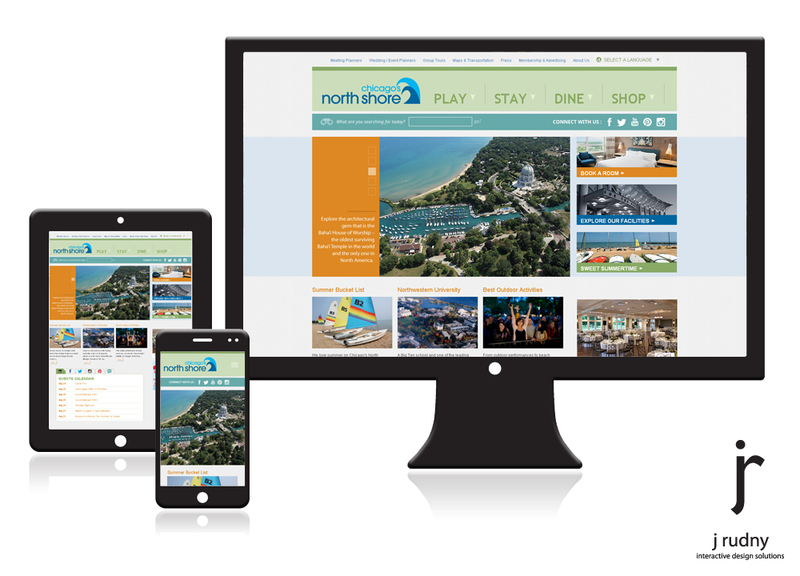 Our solution was to provide the Chicago's North Shore Convention & Visitors Bureau with a custom redesigned website that provided a full response for desktop, tablet and mobile devices. We also updated the backend of their site to provide them with a content management system that allows their staff to have 99.9% control over all of the content, pages, including the ability to expand the site and navigation on their own. In addition, our solution fully integrates their membership CRM data provided by thier existing Simpleview CRM system. "J Rudny listened to our needs and provided us with a creative solution that allows us to have full content control, grow our destination, and increase our organic search reach. Their team provides an overall great experience and continued working relationship," said Gina Speckman, Executive Director of Chicago's North Shore Convention & Visitors Bureau.